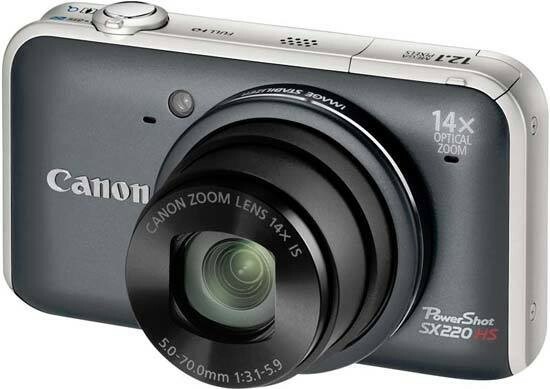 The Canon PowerShot SX220 HS improves on the previous SX210 model primarily by offering more features at a cheaper price. In particular the use of a backilluminated sensor and addition of full 1080p HD movies makes the new SX220 a more than competent all-in-one camera for both photos and video. Coming in at a full £90 cheaper than the SX210 on launch, and £30 less than its bigger brother, the SX230 HS, this model definitely strikes the right balance in terms of price versus performance. It may not offer the built-in GPS of the SX230, but in all other regards it's identical, so if you don't feel the need to map your photographic progress, the SX220 is definitely the one to opt for. It may be larger than most compacts, but once you've become used to a camera with such a broad focal range that it's possible to frame up subjects near or far in pretty much an instant, it's a real drag to go back to your common-or-garden 3x zoom snapper, the usual 'family friendly' tool of choice. The larger physical size (over, say, a slimline IXUS) also means that children and the elderly should find this offering easier to grip and operate than the latest credit card sized camera alternative. And even with bigger than average dimensions it's still a more portable option than any DSLR or Micro Four Thirds or rival system hybrid for those looking for an able travel companion. Image quality is slightly improved on the previous SX210, that is to say excellent. The employment of a back-illuminated sensor helps the SX220 to perform well in low light, with a usable ISO range of 100-800 and even the higher settings proving adequate for web use and smaller prints. The inclusion of full manual controls makes SX220 HS as well suited to more experienced users looking for a compact alternative to their DSLR as it is the beginner, although as you'd perhaps expect there is no raw format support to sweeten the deal further. The new Canon PowerShot SX220 HS is a more sensibly priced and better-specced challenger to the market-leading Panasonic TZ-series, going head to head with the TZ18, which it actually betters on paper in quite a few aspects. Judged on its own merits, the Canon PowerShot SX220 HS is a strong recommendation as a travel zoom camera that does it all with the minimum of fuss.